The common wisdom is that you should book a hotel as soon and as early as possible. This guarantees you will have a room when your travel date arrives. However, if you also want to get the best deal possible you might want to play the wait and see approach as inventory is constantly moving through Hotwire.com. The best deal on a hotel you want might not be listed on Hotwire today but it could be added tomorrow, or next week. To get the best of both worlds I recommend you start out by booking on a free-cancellation site such as Booking.com. Buy an acceptable hotel on Booking.com and then cancel the order for free if you find a better deal on Hotwire or Priceline later. Once you have a room ready for you you can have patience and try to get an even cheaper/better room. The average price jumps up over $100 per night to $149.95. This makes sense when you think about it since Las Vegas is a popular weekend destination by the many people living in Southern California. A jump in weekend prices is common among hotels near resort destinations since we live in a economy filled with dull 9-5 Monday through Friday type jobs. A price increase during the weekend isn't always the case. There are some hotels that cater more to business professionals that don't increase prices during the weekend. They are rarer but you can find them. There are also other factors such as conventions, large weddings, and other events that can increase the demand on hotel rooms. In both of the above price maps there is pretty large fluctuation from day to day on price. Just make sure you don't book at the top of one of those spikes. 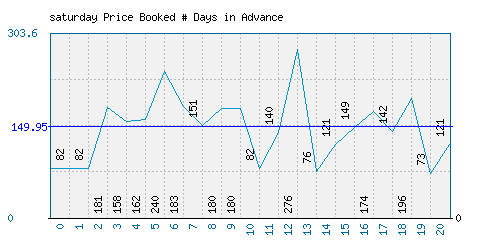 Now that you have a good idea of what day of the week to book you need to think about how many days in advance to book. Again the price maps I provide on this site can give you a clue. 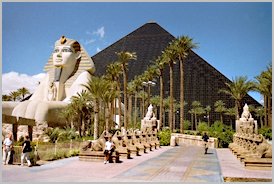 It can be different for each hotel luckily I collect extensive historical price data on each hotel. On the price map you can think of the left most side being the average price you should expect if you booked the same day as your visit. 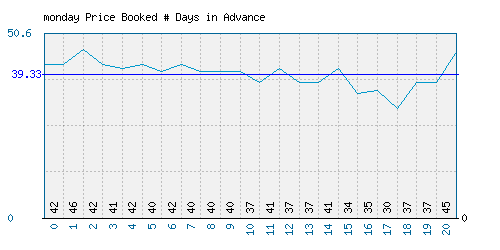 On the other end is the average price you should expect booking 20 days in advance. 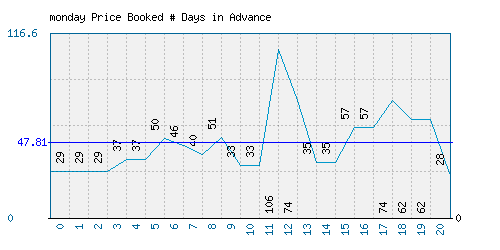 You could book further in advance but I notice most of the fluctuation in prices happen 3 weeks before the visit date. For this hotel located in the Coachella Valley You can see on average the price dips about 2 weeks out and then gradually increases the closer you get to the visit date. I'd try to get a deal in the low $30's about 2 weeks in advance. Other hotels show similar or opposite patterns. Some hotels appear to show no pattern at all; in which case it might be a good idea to check the hotel price every day until the price drops below the average. Be warned though: Hotels can remove their listings from Hotwire at any time and you will miss out. Also changes in Seasonal Prices can make historical price data useless. Ski resorts keep their rates low until the first snowfall of the season and afterwards there is no hope of getting a good pre-season deal. Keep this information in mind the next time you are booking a hotel and the magical savings fairy will bestow you with a bountiful harvest of good deals!